A Christian Christmas song or a hoodie? Get both! 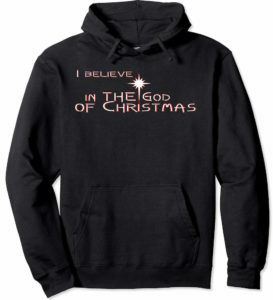 This Christian Christmas song comes in a hoodie. When you get your own hoodie, email me some proof…either a copy of the receipt (including your credit card info…Just kidding) or a picture of you wearing it. When you do, I’ll send you the matching true Christian Christmas song. There aren’t many of those to be found. Deal of the century…right?! Well, maybe deal of the minute. Anyway…happy holiday shopping and I hope this helps keep the reason for the season near and dear to your heart. Be sure to jump on the one-of-a-kind Rhyme and Reason Bandwagon today, and I’ll send you some free rhymes and reasons right away. Music, a book, and lots of good faith, hope, and love stuff. Be sure to share this with everyone you know. And don’t be surprised if they get mad at you for it.